‘Wherever there is a hill, there is an abode for Lord Murugan.’ True to this saying, there is a beautiful temple for Lord Murugan at the foothill of Velimalai, on the southern tip of the Indian subcontinent, fifteen kilometers northwest of Nagercoil on the road to Thiruvananthapuram, bordering the town of Padmanabhapuram. Set in scenic surroundings, the temple is renowned among all the Murugan temples in Kanyakumari District. There are many versions as to how the hill derived its name veli malai. Vel was the surname for the Ay rulers.  The Ay kingdom was a medieval Hindu feudal kingdom on the Malabar coast of South India. The hill that belonged to the Ay rulers came to be called as Velimalai. It is also known as Velvi Malai since Lord Murugan performed a yagna of sublime love, for the purpose of union of jivatma with Paramatma. Kumarakovil is also known as Kumara Kshetram and Subrahmanya Sthala in Malayalam. 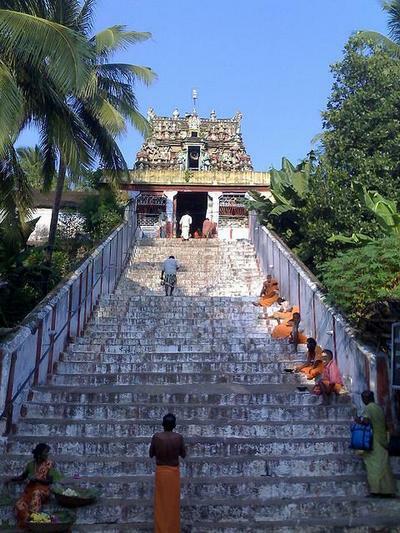 The early Tamil epic Cilappatikkaram refers to the temple as Chera Nattu Aeragam. Kumarakovil is a very ancient temple, as attested by the massive sculpture of Lord Murugan in a style dating from the Buddhist period. Buddhism probably flourished from 650-850 CE in Kerala. However, the available inscriptions about the temple date from from the 18th century CE only. The temple is accessed through a flight of forty steep steps. Lord Murugan graces the devotees with His consort Valli. He is faces the east and said to be facing Sthanumalayan (Lord Siva) of Suchindram. The idol of Lord Murugan is a monolithic sculpture measuring eight feet and eight inches in height. Its long ears indicate that it belongs to the Buddhist period. Goddess Valli who adorns the sanctum is six and a half feet tall. Nandipadam and Murugan Padam on the top of the hill are believed to be the imprints of Nandi and Murugan. Kalyana Vinayakar, who aided His brother in His marriage with Valli is in the right side of the entrance to the inner circumambulatory path. 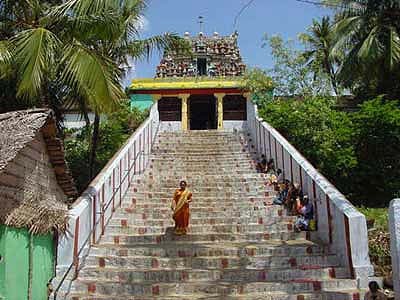 On the western circumambulatory path there is a shrine for Kasi Lingam and on the southern circumambulatory path there are shrines for Mahadevar, Sivakami and Chadikeswarar. 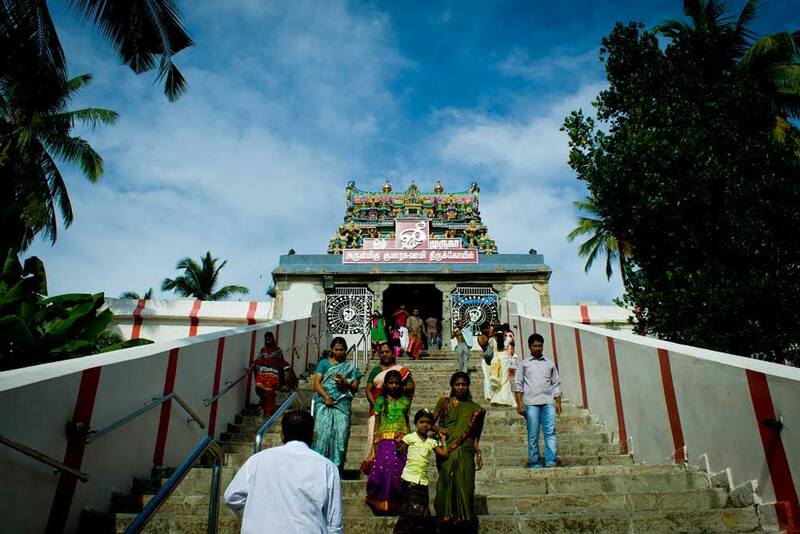 The unique feature of this temple is that there is a shrine for Daksha, the maternal grandfather of Lord Murugan. The sacred tree of the temple is a venerated vengai tree that is a hundred years old. Here, Arumuga Nayinar (Lord Murugan) is flanked by both His consorts, Valli and Deivayanai. 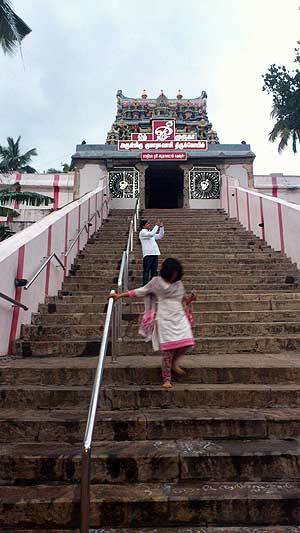 This temple is associated with the legends of Valli’s marriage with Murugan. This is said to be the birth place of Valli. Valli guhai is on the top of the hill which is two kilometers off the main temple, Valli sunai, a pond where Valli took bath, Valli colai, the millet field that Valli guarded, and kizhavan colai is where Murugan came in the disguise of an old man to woo Valli. The protocol of worship offered here is Kerala Tantram. The divine wedding of Valli and Murugan is celebrated with great fervor in the Tamil month of Panguni (March-April) and is attended by thousands of pilgrims all over the state. Kuravar Patukalam, the war waged by Valli’s relatives against Murugan, is colourfully re-enacted during the divine wedding. The seven-day festival begins in the star of Anuradha in the month of Panguni. 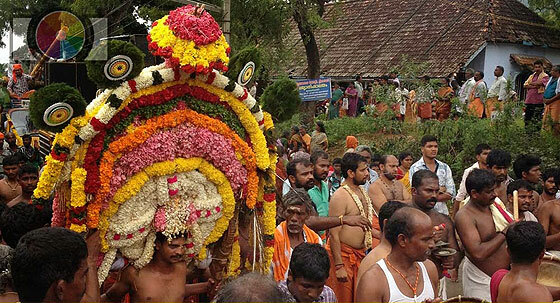 On the day of the wedding Manavalakkumaran (processional deity) seated in a palanquin proceeds towards Tiru Kalyana Mandapam which is at a distance of two kilometers from the temple. After the celestial wedding the deities are taken in procession back to the temple. En route we witness the ceremonial Kuravar patukalam. Kuravas (tribal folk of the hill) wage a war against Lord Murugan in line with the legend associated with Murugan and Valli’s marriage. When the wedded couple reaches the rear entrance of the temple, Kuravas surrender to Lord Murugan and happily consent to the marriage. Then Lord Murugan is propitiated with abhishekam and deeparadhanai and a formal wedding is celebrated at night in the decorated temple mandapam bedecked with flowers. During the marriage, Valli colai, Vatta colai, Kizavan colai...etc are given as gifts to Lord Murugan from the bride’s side. This gift list is read aloud in the assembly. Kum-kum, honey and millet flour are given as prasadam after the divine wedding. Kanda Sashti, Vaikasi Visakam and Thaipusam are the other festivals celebrated here. 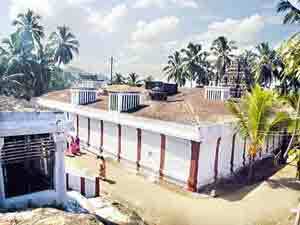 About two hundred years ago a severe draught affected this area, so the erstwhile Maharaja of Travancore ordained his security guards to offer kavadi worship to Kumaraswami. Lord Murugan answered their prayers and prosperity restored in the region. To this day, the police offer kavadi worship to Kumaraswami on the last Friday of the Tamil month of Karttikai. Kumaran Koyil Kalambagam and Kumara Koyil Pillaith Thamizh sing the glory of Kumaraswamy. 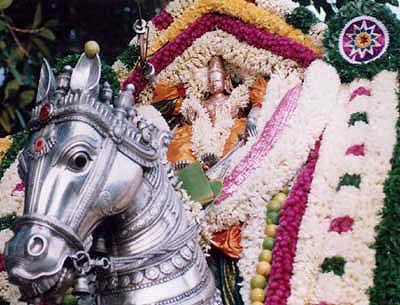 During Navarathri festival Velimalai Kumaran on a decorated silver horse is taken to Tiruvananthapuram along with Padmanabapuram Saraswati and Suchindram Munnoottinanka (Goddess Shakti). 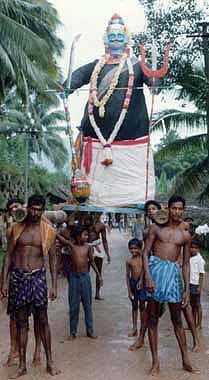 After Navaratri the idols are escorted back to the temple. Since Murugan married the tribal girl Valli here, marriages performed here are considered very auspicious. Velimalai Kumaraswami Temple, packed with natural beauty and divinity, is a place everyone must visit at least once in their lifetime. Surasamharam celebration at Kumarakoil. Left: Surapadman. Right: Kumarakoil Kumaran. This ancient temple to Murugan known as Kumaran Koyil is located at Padmanabhapuram, home to the palace of the erstwhile Maharaja, on the slopes of the Veli hills. It is located in a commanding position, visible for miles around. Legend has it that Murugan married Valli here and hence the name Velimalai, Manamalai or Kalyanamala. The main deities worshipped here are Subramanyar and Valli. A majestic ten feet high image of Subramanyar of great workmanship adorns the sanctum. The festival image of Murugan here is Manavaala Kumaran and this image is taken in procession every year during Navaratri to Thiruvananthapuram, along with Saraswati and Bhagavati from the Padmanabapuram Palace. 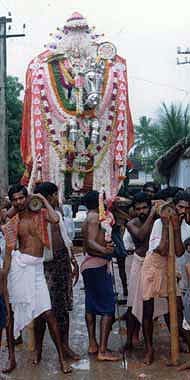 Manavaalakumaran is also taken in procession to take part in the annual festival of the Suchindram temple. Kerala Tantram is a protocol of worship offered in this temple along the lines of most other temples in Kanyakumari district. Fridays, especially the last fridays of every tamil month are considered to be very sacred here. The Kanji which is distributed here on fridays as prasadam is believed to have miraculous healing properties. Murugan's and Valli's marriage is celebrated with great splendor in the month of panguni. This Tirukkalyanam is an enactment of the divine wedding and is attended by thousands of pilgrims from allover the state. The seven-day festival begin in the star of Anuradha in the month of Panguni. Vaikasi Visakam is celebrated for ten days and as in other Murugan temples Skanda Sasti is celebrated for six days. Pushpabishekam is celebrated on the last Friday in the month of aavani when the image of Kumaran is completely covered with hundreds of baskets of flowers contributed by the congregating pilgrims. Just one kilometre from Kumarakoil Temple on the same mountain road one finds Ramji Ashram.